Dame of game Ariane Daguin is celebrating the 30th anniversary of her company, D’Artagnan, with a five-course dinner at The Hamilton in Washington, DC, tonight. Here, Daguin shares stories with sister magazine Fortune. Dame of game Ariane Daguin is celebrating the 30th anniversary of her company, D’Artagnan, with a five-course dinner at The Hamilton in Washington, DC, tonight. Here, Daguin chats with sister magazine Fortune about America’s misconception on foie gras and why farm-to-table is not a trend. For more inspiring stories, follow #FOODWINEWOMEN on Twitter. It's shaping up to be a great year for Ariane Daguin. In the first week of 2015, California overturned its restaurant ban on foie gras. Daguin, a French chef who came to the United States to study journalism, launched her company, D’Artagnan, 30 years ago as the only purveyor of game and foie gras in the US. 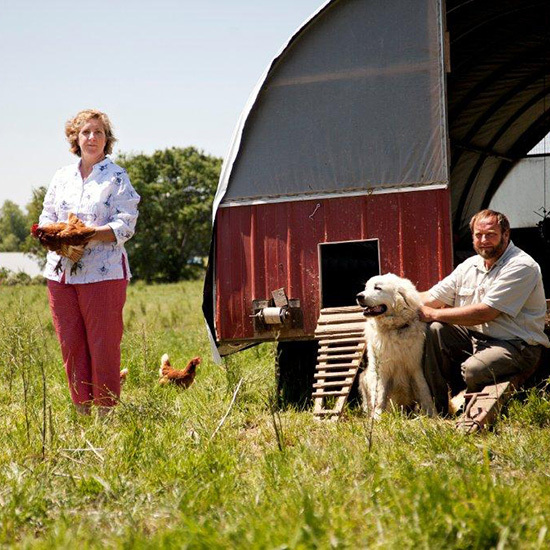 Now, Daguin is expecting D’Artagnan, the leading supplier of organic poultry and game in the country (and the preferred vendor of famed New York chefs like Daniel and Danny Meyer), to reach $100 million in sales. If she hits that goal, she plans to fly her employees back to France, her homeland, for a whole week—all 200 of them. In an interview with Fortune, Daguin shared stories about growing up with food, lessons from growing a business from the ground up and invaluable cooking tips for chicken and other game. How did your dad, André Daguin, the chef-owner of the Hôtel de France, shape your career? He did in a funny kind of way. I was the eldest, and I was destined to take over his restaurant, and that gave me the bite, I guess, to prove to myself and my family that I was worth something. But it was clear that I wasn't going to take over his business, so I tried to find another path. I really loved to write, so I loved the idea of becoming a journalist. I went to Columbia University, but I didn't have enough money. My parents didn't understand how expensive the city was, so naturally I was looking for part-time jobs, and the ones I took were in the food business because they were the only ones I knew how to do, so I just fell into it naturally. It was a very fortunate circumstance. Life is about opportunities that are there and either catching them or not. I was working at the charcuterie company, and some guys showed up saying that they were going to start a duck foie gras farm. My father's kitchen specialized in foie gras, so when those guys came in, I got all excited and wanted to draft an exclusivity contract with them. Right away, before we started, we realized we were not going to be able to survive on the foie gras and the foie gras duck alone, so that is how we started to source the best chicken and other birds. We started the whole trend of organic and no stress and no hormones, and we were the first ones to talk about it. Now it is in fashion, and everyone is talking about it. Why is farm-to-table so in fashion right now, and how has that benefited your business? First, I really hope it is not a fashion. I hope it is not a trend. We have been doing this for 30 years, and I don't think it's a trend for a couple of reasons. An animal that has been raised in a wholesome manner is a tasty dish in the end. So the top chefs will always be looking for the best quality on their plate. You need to look for the right breeds that are being raised in the free-range environment without medication at all and without antibiotics. You can have the opinion that when you eat natural things it is always better on your body, and this contributes to the popularity, no doubt, but it starts with top chefs in the kitchen. You supply game to most of the top chefs in New York, and they are mostly male. Have you ever felt gender play a role? To me, it hasn't been an issue at all. The business relationship is a friendship first because we have the same values, which is getting best ingredients possible. In all my friendships, I never see myself as a woman talking to a man, I see myself as a supplier talking to the chef. Whether that chef is a man or a woman, in that situation I don't care. I am very careful not to put gender into the equation, and because of that I get the trust from all the chefs. I do see a lot of inequality and the stainless steel ceiling in the kitchen, but I cannot say that I have had an advantage or a disadvantage of being a woman. In your opinion, what is America's biggest misconception about foie gras? That it is stressful to the animal, and it is not. The judge in California saw that when she [unbanned sales in restaurants]. PETA wants to stop all animal consumption overall, and we were just the easy target. We just proved once more that it is not any more stressful raising ducks for foie gras as it is raising chickens. Don't hesitate to go high on the fire. It is always good, especially with meat, to sear the juices. Put enough fat in the pan, wait until the pan is really hot and sear your pieces of meat and when it is a big one. In general for a turkey, to a duck to a foie gras, anything. What's your favorite wine to pair with chicken?